In addition to regular cleaning of both the interior and exterior of your boat - details of which can be found in another article contained on this website - there are also other issues of boat maintenance that you’ll need to consider. Not simply just to keep your boat running to its maximum capacity but if you don’t check certain things regularly, you could also be compromising your safety. The importance of looking after your boat’s hull cannot be overstated enough. It’s probably THE most important area of your boat yet it is the one that is often the most overlooked and because much of the damage and problems associated with a ship’s hull is below the water line, it’s crucial that you bring it out of the water occasionally to check it over. If you notice any damage or cracks to the hull, you’ll need to get them repaired as soon as possible. Also look out for problems with seacocks, clamps and hoses. Even though you may be permanently moored, make sure that you run your engine frequently to keep it in good condition and that you check the oil level. If you’re using your boat every day both of these things will become part of your daily routine anyway. If you’re running an AC powered generator onboard make sure that you run it to its maximum capacity for at least an hour every week. That means turning on all the lights and any electrically powered heating, refrigeration or air conditioning systems, some of which you might not be using much at certain times of the year. The reason for doing this being that any electrical device which is standing still in a water based environment for too long has more potential for corrosion and rusting. Likewise, routinely check all your electrical wiring for signs of wear and tear and have any suspect wiring repaired or replaced by a qualified electrician. You need to ensure that any bilge pumps are kept free from debris and cleaned of any slime, grease or oil as not only will this affect their performance but pumping any type of fuel or oil overboard is damaging the environment which could get you into trouble with the relevant authorities. Also remember to check things like batteries and any navigational and communication equipment regularly and that things like valves, switches, portholes, latches and hatches and anything mechanical are all kept well maintained. A good marine specialist dealer will be able to offer you the best advice on the types of maintenance tools and other maintenance equipment and accessories you’ll need depending upon the type of boat you have and whether it’s a static boat or you’re on the move a lot. If you’re not that mechanically minded, you can also find boat maintenance specialists who will do a thorough check on your boat and indicate any repairs or damage to it and fix them for you and they will also ensure that your boat is kept running to its maximum capabilities. 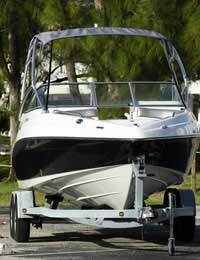 That said, however, whether you’re mechanically minded or not, there are certain things related to boat maintenance that you’re going to need to know about and take care of on a regular daily basis. Once again, a marine specialist dealer will be able to advise you and there are plenty of online resources which you can refer to.